I don’t know many pop-culture lovers who aren’t fans of the original Planet of the Apes. The success of the much-revered 1968 original prompted four sequels, none of which had the entertaining kick of the first installment. And as much as I admire director Tim Burton, I have to admit that his 2001 trip to the Planet of the Apes was a bit of a disappointment. 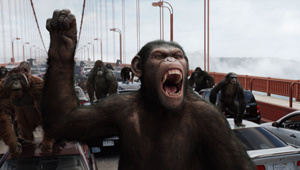 Now comes Rise of the Planet of the Apes, an origins movie that reflects a deep understanding of B-movie pleasures. This installment functions as a worthy prequel to the 1968 edition, which starred Charlton Heston and some very fine actors in ape makeup. This time, a mixture of CGI and motion-capture photography allows the filmmakers to go ape, filling the screen with primates that are misused and abused by humans who don’t respect their integrity as living creatures. Rise of the Planet of the Apes connects to the original in ways that can be both smart and amusing, and Andy Serkis, who did such brilliant motion-capture work as Gollum in The Lord of the Rings, gives Caesar — the movie’s principal ape — a sense of gravitas and well-earned indignation. No question about it: This time, our sympathies lie with the apes. As the story unfolds, Caesar — who’s raised in the home of research scientist Will Rodman (James Franco) — makes the transition from rambunctious chimp to the leader of every primate in the San Francisco area: those used in cruel lab experiments and those housed in zoos. Thematically, Rise of the Planet of the Apes can’t be viewed as a groundbreaker. It cautions against the ways in which hubris undermines science, and peddles the familiar notion that some things are beyond our control — and should remain that way. I say forget the themes: The movie doesn’t fuss over them anyway. Enjoy this skillful mixture of story and action for what it is, recognizing that everything that happens in the realm of the apes will be more compelling than whatever transpires in the human world. When we meet Franco’s Will, he’s working on a serum called ALZ-112. The drug has great commercial potential because it’s supposed to reverse the debilitating effects of Alzheimer’s, a disease that has stricken Will’s father (John Lithgow). It doesn’t take long for Will to go a little rogue: After a violent outbreak by Caesar’s mother, Will’s company orders the destruction of all of Will’s research chimps. That’s how baby Caesar winds up at Will’s house: Will smuggles the tiny chimp out the lab. The rest of the movie involves the ways in which Will continues his research, and Caesar continues to develop. The chimp learns to communicate using sign language and observes the world around him with more than animal-like curiosity. of course, Caesar has a leg up on every other chimp in the world: He was born with developmental potential his genetically altered mother passed on to him. But like his mother, Caesar still has plenty of animal impulses. A violent episode triggered by a challenge to Caesar’s protective instincts results in Caesar’s confinement in an animal shelter. In this dank animal prison, Caesar emerges as the freedom-loving leader of the ape world. All of this builds toward an action-packed finale on the Golden Gate Bridge during which director Rupert Wyatt finds the right mix of violence, dread and primate-administered retribution. Let’s just say that prospects for humanity become bleak. Rise of the Planet of the Apes can’t be called an actors’ movie, but Franco does a decent job as a scientist whose work forces him to confront serious moral questions. Frieda Pinto offers support in the mostly thankless role of a veterinarian who becomes Will’s love interest. David Oyelowo appears as the drug company’s profit-crazy boss. Sometimes, the human action lags, but Wyatt delivers when it counts, and Rise of the Planet of the Apes turns out to be entertaining, ominous and amusingly over-amped. Credit Wyatt with playing the movie’s signature moments for all they’re worth. Honesty compels me to tell you that the chimps sometimes look like they belong in a computer-generated zoo; i.e., they don’t always look real. But I admired the fact that Wyatt has made one of the best kinds of genre movies, one that knows its place. And just in case you have difficulty rooting for the apes, a word of advice: Think back to the recent Congressional debate about raising the debt ceiling. Keep Congress in mind, and the apes will start looking a whole lot better.